As anyone who reads my blog will know I'm a greyhound nut. After being dog-less for most of my life, I fell in love with the breed seven years ago and after giving Mina a home, went on to give two more greyhounds - Stevie & Jasper - their forever homes. I'd love more greyhounds but we'd need to sell the car for a van, buy a bigger house and I suspect, if I did sneak one home, I'd need a new husband! Each year in the UK around 8-10,000 greyhounds retire from racing. 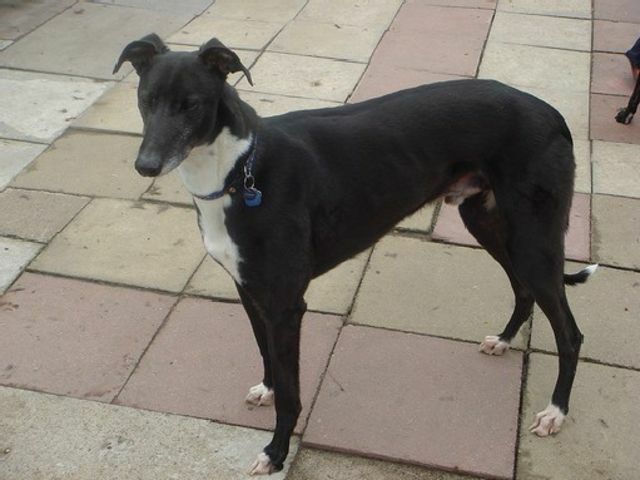 There are a number of charities that rehome greyhounds including the Retired Greyhound Trust (RGT), Greyhound Rescue West of England (GRWE), Lincolnshire Greyhound Trust (LGT), Greyhound GAP and all of them do a marvellous job. 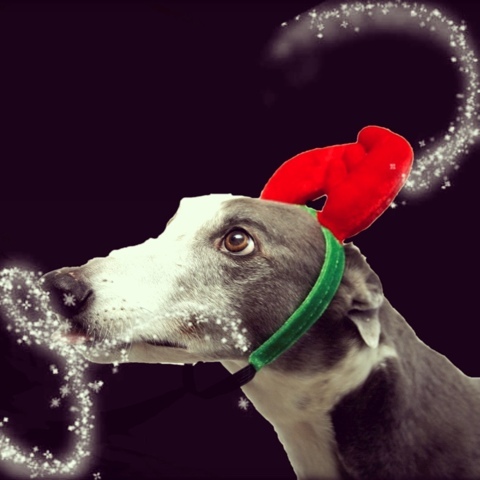 However, there are many greyhounds in rescue kennels and rehoming charities this Christmas who are still searching for a home to call their own. Err, no! Greyhounds are bred for short bursts of speed not stamina. Most are happy with two 20 minute walks a day, which means they're often suited to homes that may not have the time for very long walks each day. They can walk for longer but their stamina should be built up before embarking on a lengthy walk. Whilst it's true that greyhounds have been bred and trained to chase, it's not true to say that they can NEVER be let off a lead. Like any dog, training a reliable recall takes time and every dog is different. 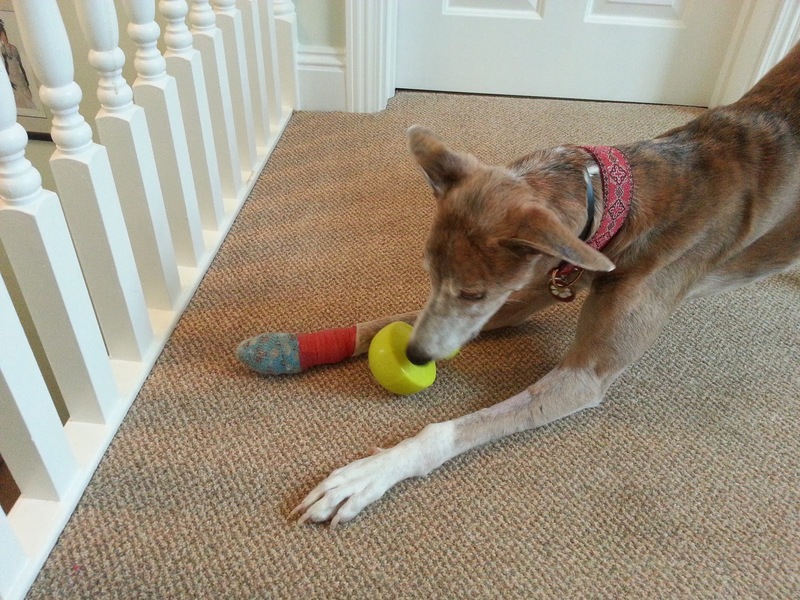 Some greyhounds may struggle with recall but many can learn it (check out Mina's video below). However, it is always better to err on the side of caution. If you haven't trained a recall - DON'T let your greyhound off the lead and expect them to come back when you call them! Also, if you've not worked on impulse control, you'll find it difficult (if not nigh on impossible) to call a greyhound back to you when they're in chase mode. Really?!? Someone better tell that to my 3 hounds! 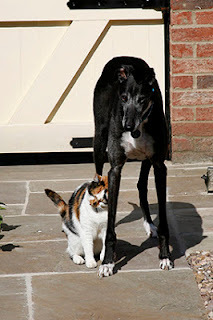 In all seriousness though, not ALL greyhounds are suited to living with cats or other small furries. For some the chase instinct is so strong that it would be dangerous to place them in a home with another small furry. All rescue/rehoming centres can advise you whether a greyhound is cat-friendly, cat-trainable or can't live with cats.Many greyhounds, with careful training, can adjust to life with cats, chickens and even rabbits! Most greyhounds have a good appetite and they're naturally slim dogs (you should be able to see the outline of the last 3 ribs). 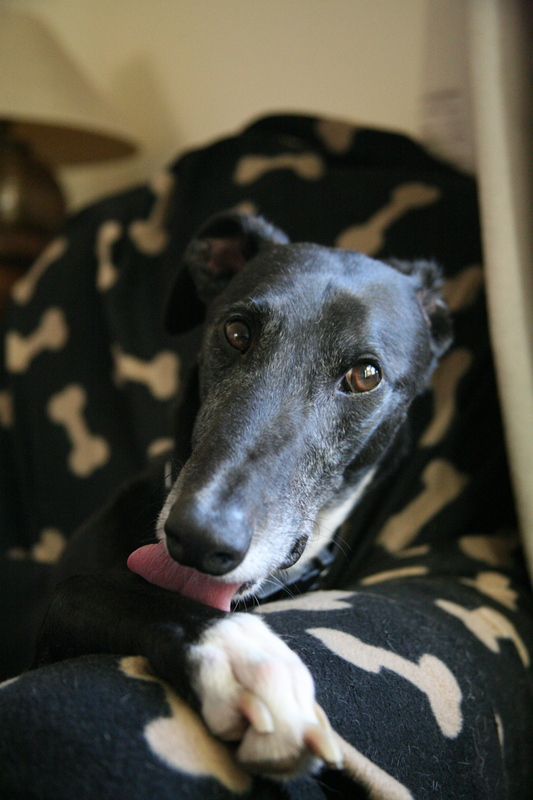 Some greyhounds may be picky eaters - but many breeds can be picky. Whilst most greyhounds won't have been taught any voice cues or basic 'obedience' training during their racing careers, that doesn't mean that they are incapable of learning new behaviours post-racing. Mina is the one who seems to enjoy learning the most. She can sit, lay down, stand, wait (until released) and stay (until I go back to her). She's had a go at agility (until her canine catastrophe ways meant she had to retire) and used her lovely long nose in scentwork. She loves trick training and does a mean retrieve and recall. Stevie is very food motivated (which helped with training). He was 'cat-trainable' when he arrived with us and I spent a lot of time working on his impulse control around food and then the cat. For a dog that used to think nothing of snatching a treat out of your hand, we can now put treats on his paws and ask him to leave them (and he will) before we release him to eat them. Stevie came to us with great recall and like Mina, he's really taken to nose work. Jasper is the 'hardest to reach' of all my three hounds and although I've learned something from each of them, Jasper is the one who has taught me the most. His recall is improving, he's got a good wait and has grasped targeting. I've also introduced Jasper to nose-work and he loves it too. 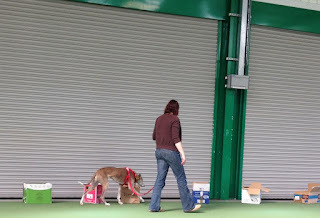 If you'd like to see how successful greyhounds can be in doggy disciplines like agility or competitive obedience, you really need to check out the marvellous Never Say Never Greyhounds blog. 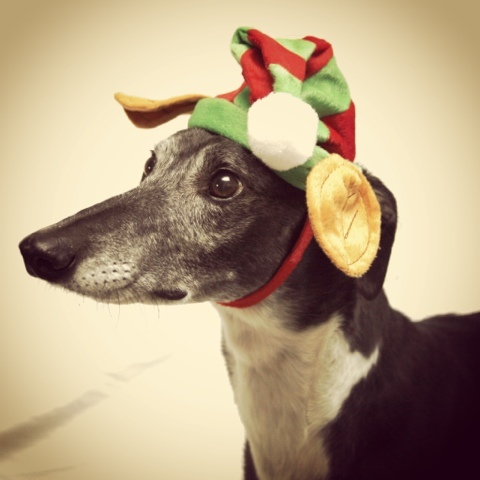 Jennifer and her greyhounds excel at agility and the blog is a 'must-read' for any greyhound fan. Most greyhounds adapt very well to life after the track. Their reputation as the 45mph couch potatoes is very true. Most of the time they are very laid back (and could give Tula, the cat, a run for her money in the sleeping stakes). They're very affectionate and each have their own personality. "Greyhounds aren't my whole life, but they make life whole." So, if you've ever considered offering a greyhound a home, I'd urge you to visit your local greyhound rehoming centre and go and meet some. Be warned though, greyhounds are addictive and one is often not enough! It's that time of year. The shops are full of Christmas decorations and Christmas carols can be heard everywhere. For many of us, our thoughts turn to presents and what to buy our nearest and dearest...including our four legged friends. Call me mad (after all, I am known as the 'mad' greyhound lady in the village) but I like to give the hounds a present (or two) on Christmas day. I know they don't know what day of the year it is and why we give presents but why should they miss out? Well, if you're wondering what to pamper your pooch with this Christmas, or are wondering what to buy a dog loving friend, wonder no more! I've got a super list of five ideas - all tested either by me or the hounds - that would make a great gift this Christmas. Who doesn't love receiving a Secret Santa? All the anticipation of wondering what the gift is and who bought it. Well, there are a number of companies which provide monthly and one-off gift boxes packed full of toys, treats and presents for dogs and dog-lovers alike. 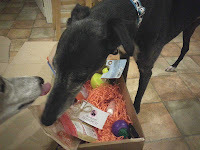 I've already blogged about Pooch Pack but for Christmas, thought I'd treat the hounds to a Fings for Fido Christmas box. ...and I wasn't disappointed! For £29.99 the box came packed with a good range of toys, treats, a Reg and Ruby edible Christmas card, a small spray of pet remedy (great for keeping canines calm), a Stag bar (well Christmas wouldn't be Christmas without a reindeer of some sort) and the latest copy of Dogs Today magazine. The toys included a 'Tug a Santa', 'Doggy lips' (I love these), a green rubber stick (for playing safe games of fetch) and an Ancol treat toy in the shape of a bone. The hounds seem very taken with the box from the moment it arrived (they can sniff out a good treat when they smell one) and Stevie had the first game of tug with Santa. I'd recommend the box for the sheer variety of gifts it provides. As I have three dogs, there were more than enough toys for one each and even Jasper, with his four remaining teeth, was able to enjoy the treats and play with the lips and the rubber stick. Why should it be just us humans who can hang edible decorations on the Christmas tree? Surely our canine companions deserve some edible (and well out of reach) delectable decorations too? Well, this year I'm trying out Reg and Ruby's edible rawhide decorations. I discovered Reg and Ruby a few years ago as their edible rawhide Christmas cards are available in my local Sainsbury's and I just couldn't resist buying each of the hounds a card. Last year, the hounds were treated to a Reg and Ruby edible advent calendar, where each day you could cut off a small rawhide bone as the treat. This year, I'm giving the decorations a go. 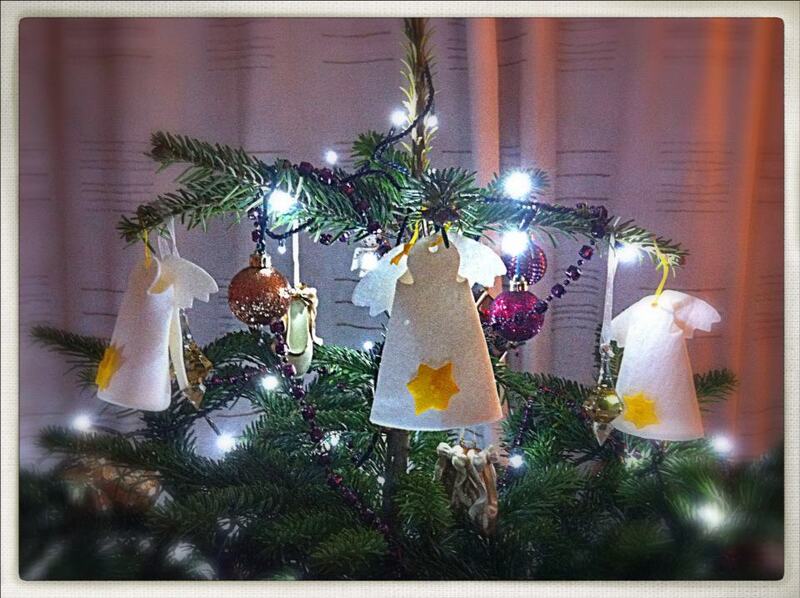 They're very pretty angels and as of yet I'm undecided whether to hang them on the tree (well out of the hounds' reach) or display them on the mantelpiece. Reg and Ruby products can be bought online from a number of retailers including - D for Dog. Prices for the angel decorations start from £2.55, edible Christmas cards from £3 and the edible advent calendar for £7.99. I love baking home-made treats for the hounds but in the run up to Christmas, when time is short, I just don't have the time. I first came across Patchwork Pooch on Twitter and then met them at this year's Lincolnshire Show. They are a local Lincolnshire company who hand make and bake gourmet dog treats. There's even a gluten free range for dogs like Mina who can't tolerate wheat. The bone shaped biscuits come in four flavours: original, cheese, chicken and beef and prices for a packet start from £2.55. 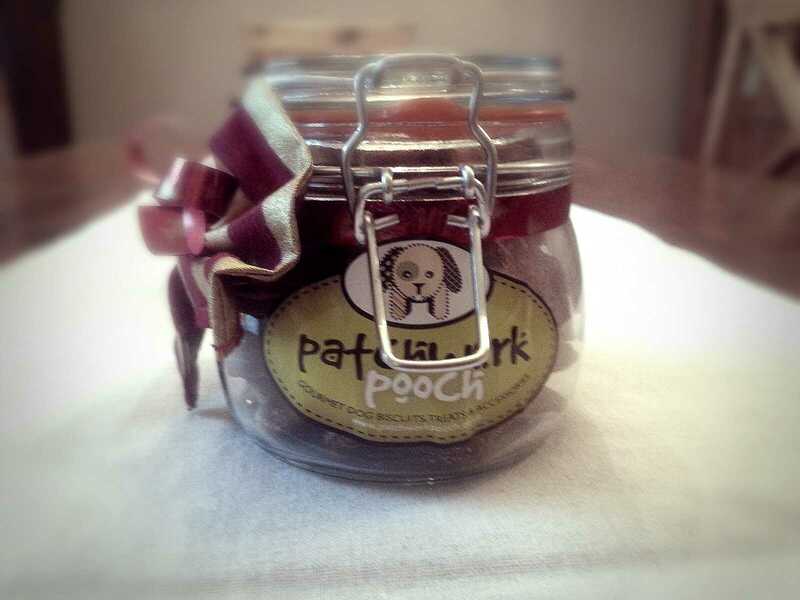 My local dog grooming salon - Fur Do's Salon - stocks Patchwork Pooch products, including the lovely Christmas jar above. I popped in to have Jasper's nails trimmed (his nails are more like hooves than nails) and came away laden with some packets of Patchwork Pooch biscuits and the Christmas jar. 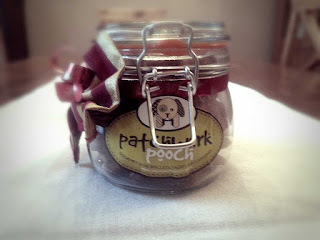 You can Patchwork Pooch biscuits and more from their website. I like a good read and certainly with my university studies, my bookshelves are now groaning under the weight of dog training and behaviour books. There are so many great dog books to choose from, it can be difficult to know where to start. Two new books have hit bookshelves this year: The Official Ahimsa Dog Training Manual by Grisha Stewart and What Your Dog Wants - 7 Key Skills of a Perfect Dog Owner by Karen Wild. 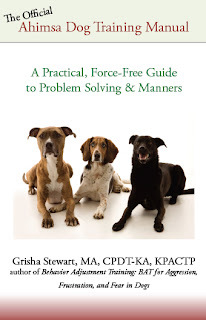 Grisha's book - The Official Ahimsa Dog Training Manual - is suitable for dog owners, trainers and breeders. It contains a great introduction to the science behind dog training and how dogs learn - in a very reader friendly way. The book also introduces clicker training and explains how and why it works to such great effect with our dogs (and many other animals). There is a great section on dealing with problem behaviours including puppy biting and chewing, barking in class, separation anxiety and resource guarding. The bulk of the book is dedicated to showing and explaining to the reader how to create good habits for their dogs, in a humane, force free way. Grisha often provides several different ways for teaching an exercise and plenty of advice to make sure both you and your dog succeed. What your dog wants is written by Karen Wild. 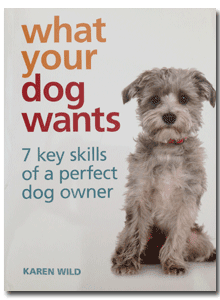 It is an easy to follow guide to building a better relationship with your your dog and is split into seven key skills for dog owners: Comprehension, Communication, Understanding, Motivation, Stimulation, Awareness and Responsibility. The book is packed full with great colour photos throughout, which really help illustrate the topics. 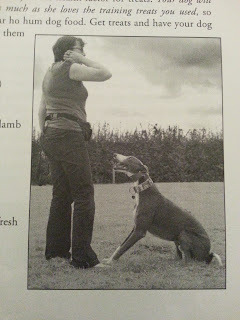 The Communication section contains a break down of how dogs learn and see the world, along with step by step instructions (and photos) for basic training. The Awareness section helps the reader understand the needs of dogs at their different life-stages and the final section on Responsibility is packed full with sound advice on keeping your dog safe (and on the right side of the law)! 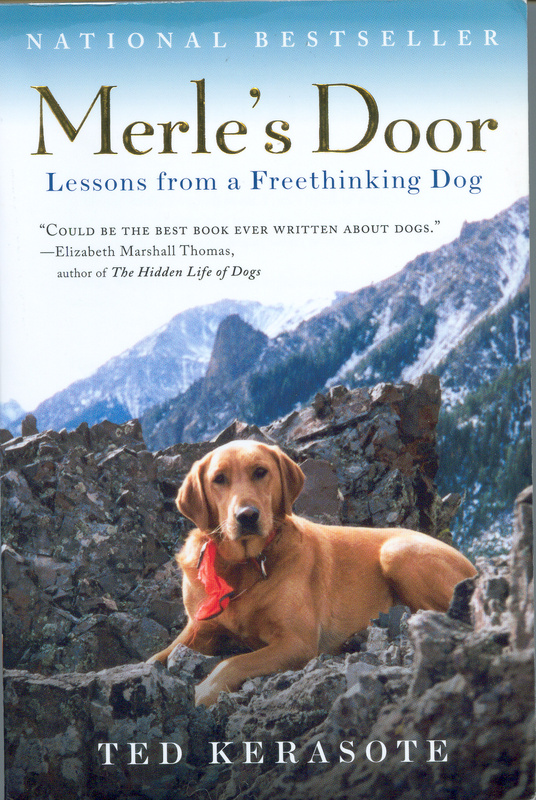 Merle's Door, by Ted Kerasote, isn't a dog training book as such and may not be a book you have heard of (despite being published in 2007). However, it is worthy of any Christmas stocking. The book chronicles how Ted found Merle -who was living wild - whilst on a camping trip to the Utah desert. Ted had been looking for a dog to keep him company when their paths crossed. It is a story of their life together and the author's reflections upon dogs in modern society and an increasingly urbanised world. Marley and Me, it is not. It's 361 pages long and I found it a riveting read, which is why it is still on my bookshelf. 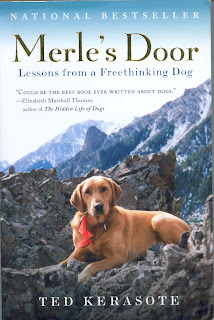 Reading it opens the door to another lifestyle completely - both that of Ted and Merle. It certainly provides food for thought. The book is available on Amazon in both paper back (£8.45) and hard back (£14.32) formats. It wouldn't be Christmas without a Christmas themed toy for the hounds to try. 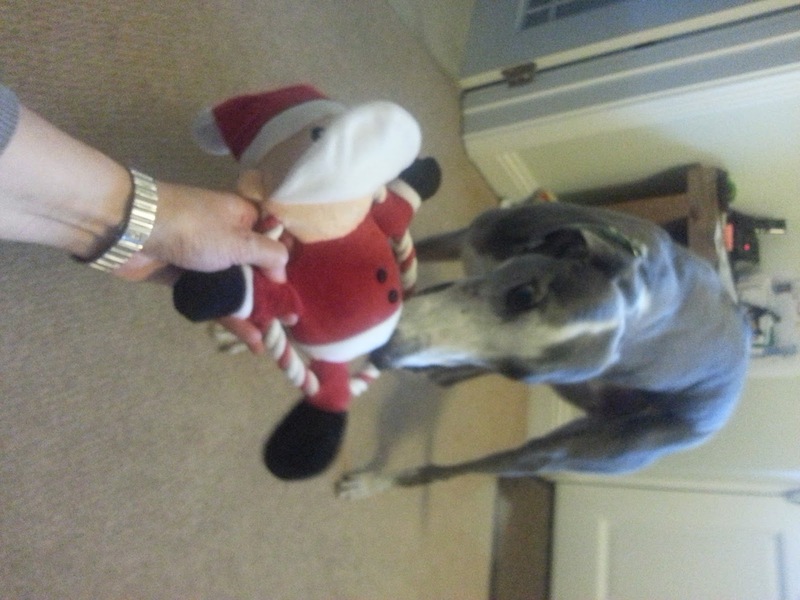 Each year I look for a new toy to try... over the years we've had a fat Santa ball, Christmas pudding tug toys, snowmen toys, penguin toys and even a turkey toy! 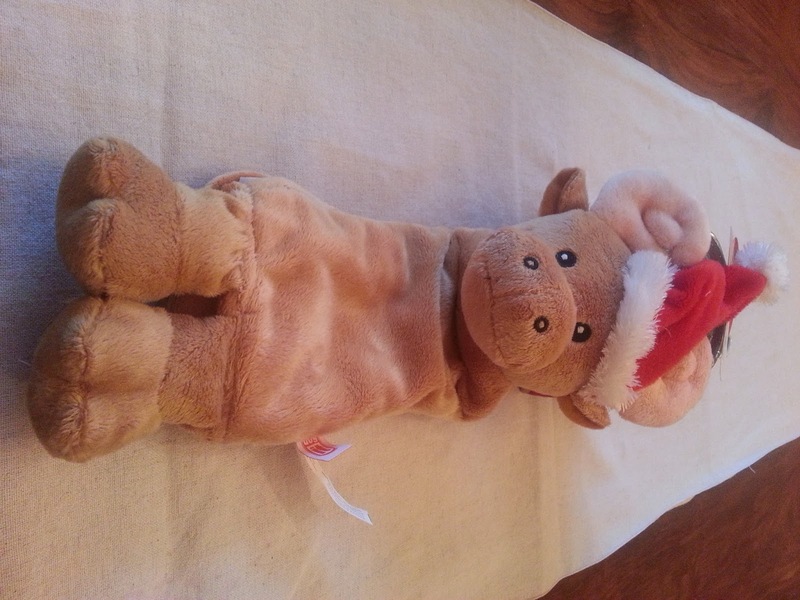 This year I've found a reindeer toy with a bit of a difference. The dog it reindeer crunch is a toy that you can put an empty plastic water bottle in, which gives it that added allure (especially for Mina). 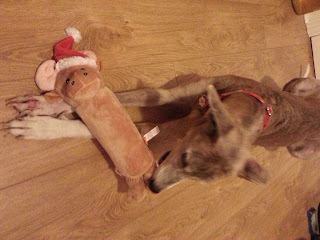 It's also got a squeaker in the head - just in case the noise of crackling and crunching the water bottle isn't enough to excite your dog! Mina loved it (she's had a sneak test-run before Christmas, so I could write about it on the blog). How long it will last, I'm not quite sure - after all Mina is a squeaker seeker and destroyer extraordinaire. 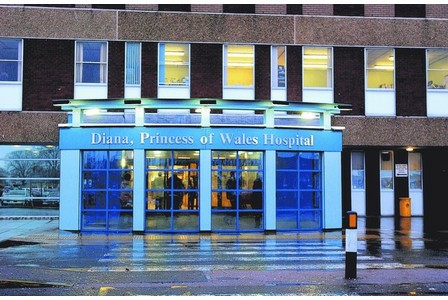 It seems pretty robust, so we'll be keeping fingers and paws crossed that it lasts into 2013. 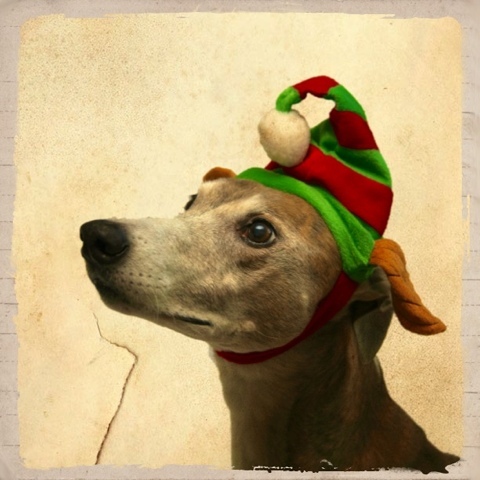 I hope you've found some inspiration for Christmas gifts and if you've some other ideas of what would make great Christmas presents for hounds and their humans, please do share them in a comment. Who doesn't like receiving packages and gifts through the post? Not many people I suspect. Personally, I love receiving packages through the post and the anticipation of what goodies may be lurking inside. Now, even our dogs can experience this and, if you choose so, on a monthly basis too! Just like a magazine subscription, there's not much that you can't get delivered to your door on a monthly basis. 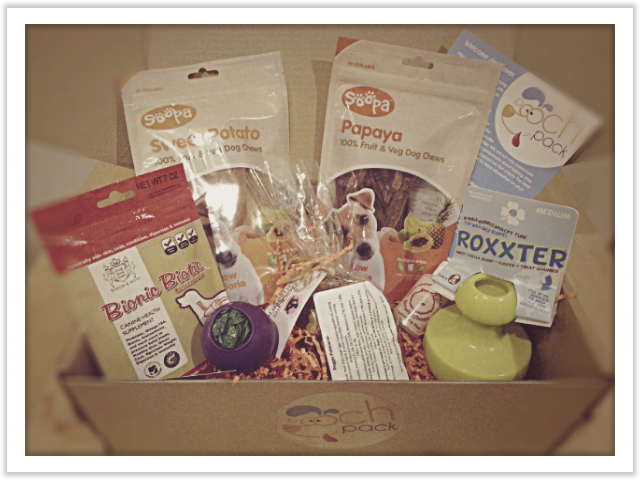 Pooch Pack is a gift subscription service for dogs (the name is a bit of a giveaway really)! You can choose to have a one-off delivery or subscribe for 3 or 6 months and then sit back and wait for a box of doggy delights to arrive. Each box contains 5-6 products that have all been specially selected to appeal to the most discerning of dogs (you can specify the size of dog when ordering, to make sure products are suitable). So, when I was offered the chance to try out a Pooch Pack, I jumped at the opportunity. I was impressed by the simple, yet effective, packaging (plain and very sturdy cardboard box, with a Pooch Pack sticker and orange shredded paper - just enough to protect the contents) and I loved the contents card with its QR codes (these really appeal to the marketer in me and make it super easier to get to the suppliers websites). However, the real proof in the pudding isn't what I think of the box and its contents, it's what my three greyhounds made of it. It didn't take much encouragement for the hounds to get stuck in (quite literally) to the Pooch Pack and its contents. One of the things that hit me when I first opened the box was the strong smell of vanilla. I couldn't fathom where it was coming from until I had a look at the Dublin Dog Roxxter. I have to say I did find the smell a little off putting and wondered why the dog toy is scented with vanilla - is it for human or hound benefit? Anyway, it didn't seem to deter the hounds. I've not seen a treat dispenser like the Dublin Dog Roxxter before, so did wonder how effective and attractive it would be to my greyhound gang. Well, so far, it's proven to be a hit. Both Mina and Stevie have taken it in turns to dislodge treats from it. The only thing is, the treats need to be relatively small to come out - larger treats get stuck and aren't as easy to dislodge as they are from other well known brands of treat dispensers. 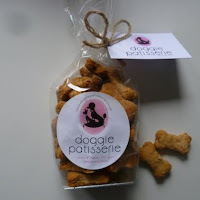 The Doggie Patisserie treats have also proven to be a hit - both with the hounds and me! They're made from just five human-grade ingredients: wholemeal flour, oats, honey, peanut butter, semi skimmed milk and baking powder. They look and smell delicious and as the content card said "Human grade ingredients only so if you're felling peckish, you can nab one too!" I did! I can confirm they are rather moreish and the hounds may have to 'fight' me for them! I'm always on the look out for treats that my snaggletoothed hound, Jasper, can eat. He only has his four canine teeth left so traditional chews aren't really suitable. There were two bags of chews included in the box - papaya and sweet potato. 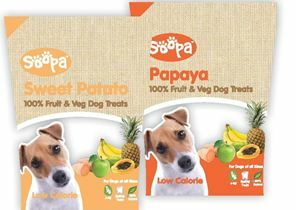 The treats are 100% natural, as well as being wheat and grain free (another big tick for me and for Mina). Jasper seems to be able to eat them quite well, although he definitely prefers the papaya over the sweet potato. So far, I haven't had a chance to try out the other goodies. I already have several poop sack dispensers, that attach to leads, so I'm not sure whether the Doggee is for me. The Pooch and Mutt Bionic Biotic looks good and the package provided with last Mina for one month. The Scruffy Chops shampoo smells lovely but a shampoo for the hounds isn't needed at the moment, so I'll have to wait to try it out. If you'd like to find out more about the Pooch Pack and getting one of your own delivered, simply visit their website at www.PoochPack.co.uk Prices start at £19.95 for one month's supply, £18.95 per month if you subscribe for 3 months and £16.95 per month if you subscribe for 6 months. Delivery is free. I have to say the Pooch Pack did impress me. It has introduced me to some products that I would never have known about and/or considered trying such as the Dublin Dog Roxxter and the Soopa Pet treats. Personally, I would have liked to see another dog toy rather than the Doggee (sorry Doggee) but all in all the contents didn't disappoint. *Disclosure: I was provided with a free promotional Pooch Pack to review . 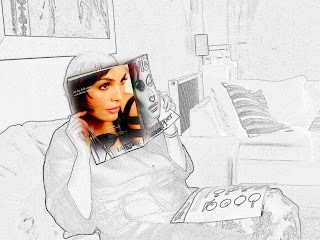 I have not been paid for my views and all views expressed are my own. 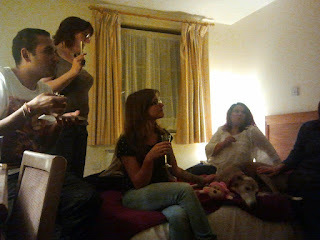 National Geographic is screening the last ever series of the Dog Whisperer and the trailers are now hitting TV screens. One of these is a trailer showing Holly – a Labrador Retriever – who is showing resource guarding around food. This trailer has already caused quite a stir (no doubt what the TV producers wanted) and has been blogged about very eloquently and succinctly by Nicole Wilde on her blog Wilde About Dogs. Nicole is a great dog trainer and author, her methods are humane and her books are easy to read, practical and grounded in fact and the science behind reward based training methods. There’s no doubt that Cesar has great communication skills but they’re definitely not with dogs – he often seems to be blind to what dogs are very clearly communicating to him. The video trailer shows Cesar working with Holly to ‘cure’ her of her food guarding…the result? Extremely uncomfortable and upsetting viewing and a bite to Cesar himself. One more dog with a bite history…one more dog labelled as dangerous due to out-dated, ill-informed and downright unnecessary training methods. After 20+ years of working in the PR/media/marketing world, I should know better. TV programmes are edited a certain way, journalistic bias does exist and in TV land it’s all about ratings. 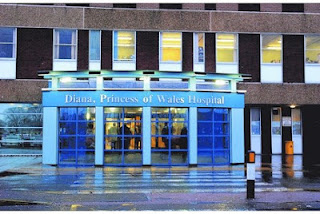 With the Dog Whisperer programmes, strip away the veneer, editing, emotive music and voice overs and what I’m now left with is a bitter taste in my mouth and tears in my eyes when I see his ‘rehabilitation’ methods in action. What amazes me most is that Cesar is heard saying “I didn’t see that coming.” Really? I think most pet dog owners could see how upset the dog was and that a bite WAS likely to happen. Rather than give Holly the space she was asking for, Cesar continued to posture, intimidate, threaten and invade her space. Any other person would have backed off. Holly was so clearly showing every warning sign and communication signal in a dog’s repertoire to say ‘leave me alone’… ‘I’m uncomfortable’ … until - in Cesar’s eyes and without warning – she had no choice left but to bite. Fear, intimidation, coercion and the causing of pain have no place in dog training – ever. When Cesar says a dog is ‘calm submissive,’ it is really Dog Whisperer code for a dog that has shut down and cannot function. Cesar often uses flooding techniques when he’s working with reactive/problem dogs. 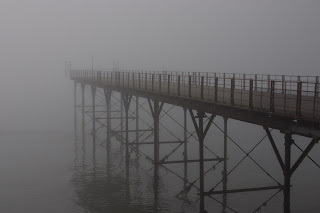 He continually exposes them to the very thing they are afraid of, with no let out until, in his words, ‘they’re calm submissive.’ I’m pretty sure if you trapped me in a room with my worst fear, with no escape route, and kept exposing me to more and more of the very thing I’m afraid of, I too would become ‘calm submissive’. I would shut down both mentally and physically to block it out. In Holly’s video he’s dealing with food guarding. 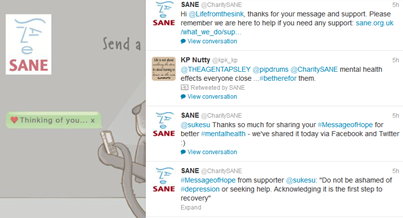 Let’s look at a human analogy…I like my food, I don’t mind sharing it (most of the time) if I’m asked. However, if I’d just ordered my favourite pizza, taken a bite and then the waiter came and whipped it away, I’d be a tad confused and somewhat miffed. If he brought it back and say, I had another few bites, then he took it away again – with no warning – I’d start to feel a little angry (and be making a mental note never to go that pizza restaurant again). I’d probably be trying to ask him why, or covering my plate/holding onto it whenever he walked by. If this scenario was repeated over and over again during the course of the evening, I would reach the end of my tether and make a scene, or resort to physical abuse as a last resort. So why would a dog react differently? Holly's food guarding issues could have been dealt with through a behaviour modification programme, using counter conditioning and desensitisation techniques. It may not make for the most exciting TV viewing but it would certainly not push Holly over her threshold to bite and, given time, it would make approaches to her food bowl non-threatening and therefore eventually eliminate the need to act aggressively. If there’s any time that the ‘please don’t try these techniques at home’ warning is needed, it’s with this show. These techniques won’t make the problem go away. 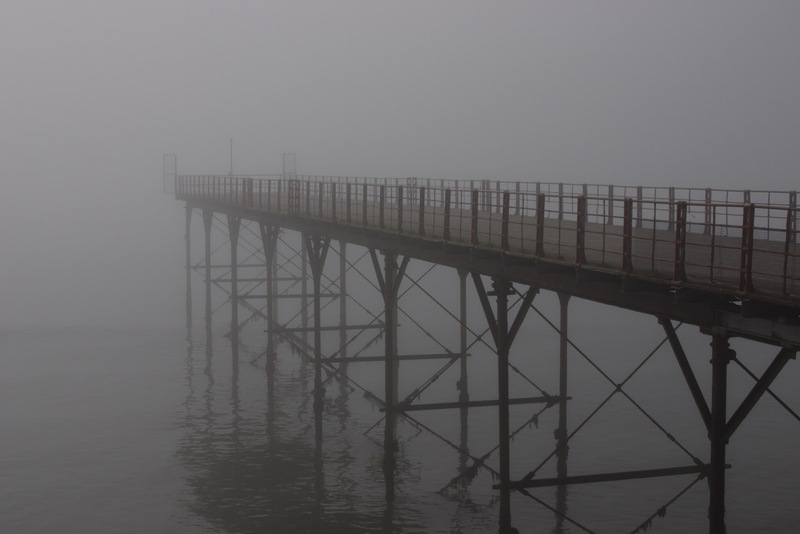 They may seem to work but more often than not they will just suppress the unwanted behaviour, and another unwanted behaviour will take its place. 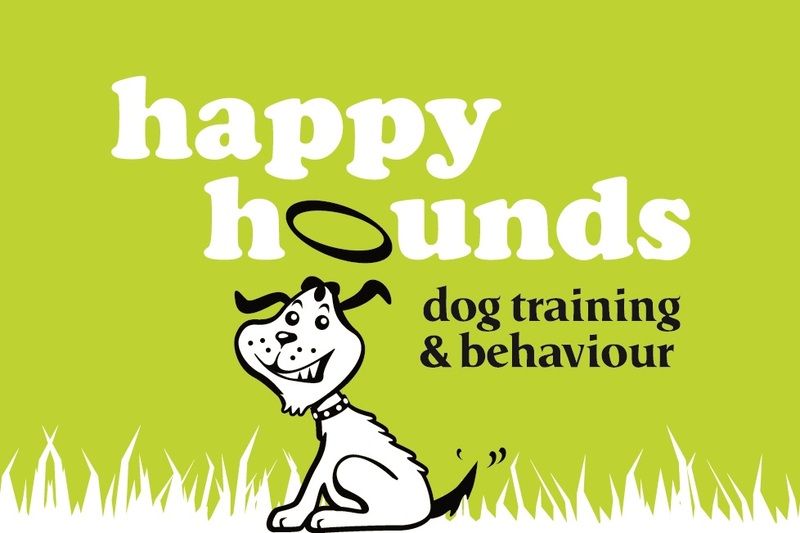 There are plenty of organisations within the UK that have qualified dog trainers and behaviour experts who can help with training and behaviour problems. If you have a problem with your dog and you’re not sure what to do, please don’t try to ‘fix it’ yourself. Both the Association of Pet Behaviour Counsellors and the Association of Pet Dog Trainers have accredited behaviour counsellors and trainers who can help. Watching the video footage of Holly's 'rehabilitation' in real time is upsetting enough but watching it in slow motion, even more so. So, you may ask, why am I sharing slow motion footage? Well if there was ever any doubt in your mind about the techniques being used or what Holly was communicating to Cesar, this slowed down video with captions cannot leave you with any doubt. If you have a dog with a behaviour issue such as food or resource guarding I implore you not to follow misguided advice or attempt to 'cure it' using techniques you've seen on the TV. Please contact a qualified and accredited dog trainer or behaviour counsellor. Greyhounds may be sight hounds but they also have a great ability that they share with every other dog - their nose and sense of smell. Mina's eyesight is beginning to deteriorate. She has had several major eye operations over the last few years and has the beginnings of cataracts and I want to make sure that when/if her eyesight fails that we can still do fun things together and this is what led me to the first UK Sirius Sniffers Seminar, organised by the Oxfordshire Animal Behaviour Centre with the founder of Sirius Sniffers - Kelly Gorman Dunbar being the trainer. Whereas humans rely on sight more than smell, and even though sight hounds predominantly hunt by sight, the dog's sense of smell is perhaps the most important of their senses. Every dog has from the smallest Chihuahua to the largest Deerhound has a great nose for smells - around 10,000 to 100,000 times better than the human sense of smell. Dogs have twice as many functioning olfactory receptors than us mere humans, meaning they can distinguish between odours that may smell identical to us, as well as sniffing out odours we can't even detect with our distinctly sub-standard noses (when compared to a dog's nose)! Sirius Sniffers aims to make nose work accessible to pet dogs. I'm not particularly competitive (remember, I'm not competing in agility with Mina) and I just want to have fun times with my dogs without the stress that competition would put me under. The Sirius Sniffers approach seemed ideal for my needs and it also meant that I got to meet Kelly along with the chance to catch up with lots of other doggy friends over the course of the weekend. 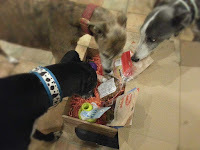 During day 1 the dogs were introduced to the idea of nose work, by using their favourite food or toy (primary reinforcer) and then hiding it in a cardboard box. Cardboard boxes were used as (a) they're easy to get hold of and (b) they contain the scent/odour quite well. It did take Mina a while to relax and suss out what she was supposed to do. However, with Kelly's guidance and encouragement and with the fact that Mina can self-reward/reinforce by finding and eating the food in the box, it made it much more fun for her (the box contained my homemade liver cake). We started the day with a box drill where the boxes were lined up against a wall and the food hidden in one of the boxes. Mina was walked up and down the line, on lead, with a chance to stop when she found the scent. We were instructed to make sure we gave our dogs space and if they were investigating a box but it didn't contain the scent/food to keep moving or move around in an arc to encourage the dog to move. We ended the day by being divided into groups with 3 dogs per group and each dog being set a different task - appropriate to their age, breed and ability. The group Mina was in had a lovely 6 month old Vizsla puppy and a Corgi who was (I think) around 4-5 years old. Mina's task was to find the food bag which was hidden in one of the boxes. It was a blind search for both me and Mina. The group set up the boxes and hid the food without either me or Mina in sight. I loved the whole seminar - it really opened my eyes (or should that be made me flare my nostrils?) to the fun that can be had with nose work. It really is great for any dog - it can help increase a dog's independence and confidence and can certainly help with reactive dogs providing focus and an alternative, acceptable behaviour outlet. I'm pretty sure Mina enjoyed the weekend. We had some 'greyt' 1 on 1 time and she won over a whole new group of fans, who obligingly provided her with attention and cuddles. I can't wait to start trying out nose work with Stevie and Jasper too and looking at how I can factor it into some of my training classes.